Become one of four fearless adventurers in a tropical jungle! Explore a lost temple and discover treasures that no human has laid eyes on for a thousand years. rack up the most points by uncharted areas of the temple and bringing back unheard of artefacts. 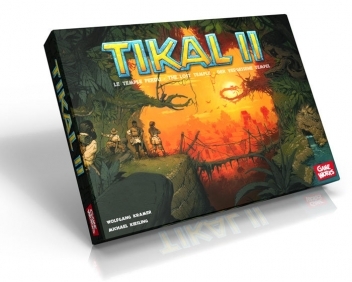 Tikal II is the sequel to the award winning ''game of the year'' Tikal. Where Tikal had you exploring the jungle, in Tikal II you will explore a temple in the Lost City. Tikal II manages to be familiar while still being an entirely new game.